Model H010PD,gpm required min-max 6-15 (30-57 lpm),max. auger diameter 24" (610mm),	weight 148 lbs (67 kg). Please inquire about additional sizes and specifications. Our premium series of auger drive units. All models are built with our heavy duty planetary gear reduction, which provides the user with years of trouble free use. All HO Series Drive Units are rated for 3000 PSI (211 kg/cm2) continuous operating pressure. 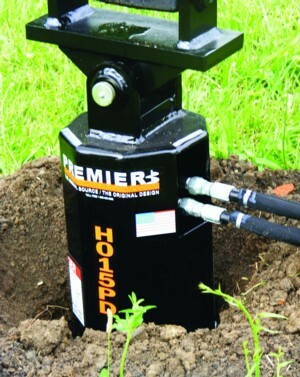 Price does not include hydraulic hoses for connecting drive unit to base machine hydraulics. HO Series Drive Units are covered by a five year warranty, refer to the warranty policy in our operators manual for details. For product literature click here You will need adobe acrobat to open the file.